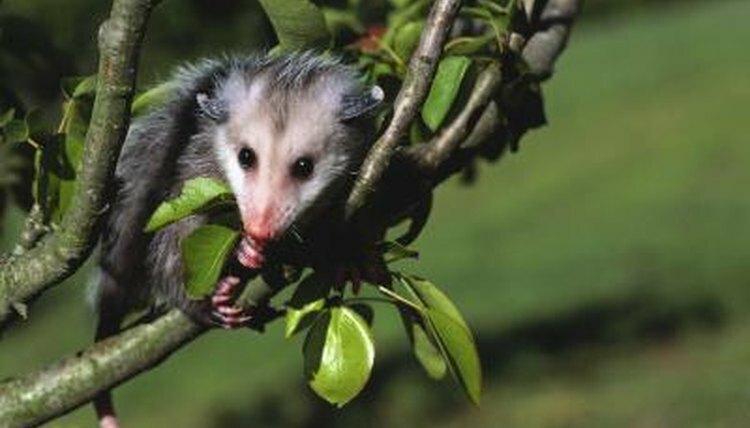 The Virginia or common opossum (Didelphia virginiana), also colloquially referred to as simply “possum,” is a cat-sized marsupial mammal native to the United States and Canada. Opossums are incredibly adaptable and can be found in a range of habitats, from isolated woodlands to busy urban areas, where they will happily make a meal of discarded garbage or roadkill. Though they are usually solitary in nature, opossum mothers spend a considerable amount of time caring for their young. Opossums are marsupials, meaning that they have some distinct reproductive physiological features that other mammals do not. Female marsupials have a reproductive system that is split completely in two, resulting in two separate birth canals and two uteri. They also, more famously, have a fur-lined marsupium or “pouch” on the outside of their bodies, in which they are able to nurse and shelter their young. This differs from the reproductive system of other mammals, the majority of which fully gestate their young internally within a placenta—a protective organ that surrounds a fetus inside the uterus. Opossum breeding season can last for most of the year, ranging from January to November depending on the location. Females generally have estrus or fertility cycles that can last between 17 and 38 days, and may have up to seven such cycles per breeding season as long as pregnancy does not occur. Female opossums will give birth to up to two litters per year, and successful males will mate with multiple females throughout the breeding season. The gestation period for female opossums lasts approximately two weeks. This short gestation period is common among marsupials, as the young do the most of their developing outside the womb. A litter of opossums generally comprises between 10 and 20 infants. These newborns are extremely small—about the size of a honeybee—and without fur, sight or hearing. According to National Geographic, approximately half of all birthed opossums will survive. Immediately after their birth, newborn opossums travel from the birth canal to their mother's pouch, where they will begin nursing, if a teat is available to them, and continue developing. Opossum infants will continue to live in their mother's pouch for about two months after their birth, during which time they are attached full-time to a teat. As the opossums grow and their senses develop, they will begin to venture outside the pouch for short periods. Eventually the young become too large to stay in the pouch and will spend their time instead on their mother's back, using their opposable thumbs to grasp her fur while she travels. Young opossums typically spend about three months with their mothers before they are fully weaned and independent. Wild Mammals of North America: Biology, Management, and Conservation; George A. Feldhamer et al., eds. Why Do Marsupials Carry Their Young in a Pouch? What Is Unusual About the Koala's Pouch?